According to the hovmoller, trades have been weakly enhanced but nothing serious or potent. StruThiO wrote: According to the hovmoller, trades have been weakly enhanced but nothing serious or potent. 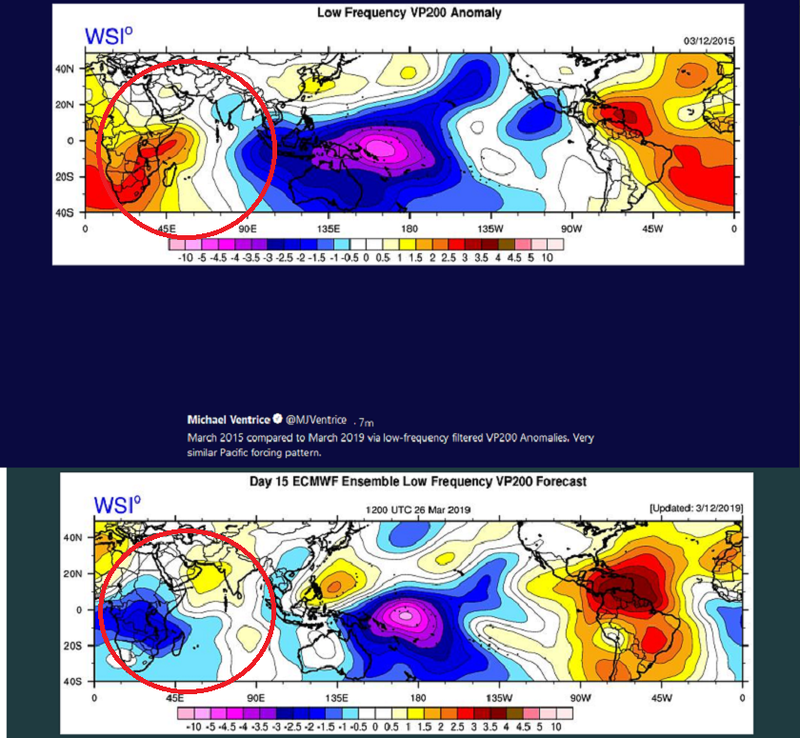 It'll show a WWB as soon as it catches on with the Euro and CFS and sends the MJO back to the circle into phase 1/8, instead of looping the MJO back into phase 3.
cycloneye wrote: Kingarabian,have the trades that Ventrice showed in the past few days have come to fructition? I ask because Niño 3.4 has dropped recently. I think the trades have been closer to normal. 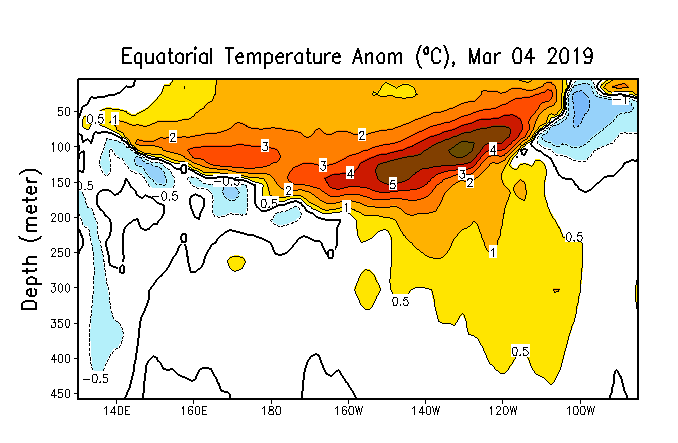 The buoys are not showing big dips over Nino 3, Nino 3.4, and Nino 4. 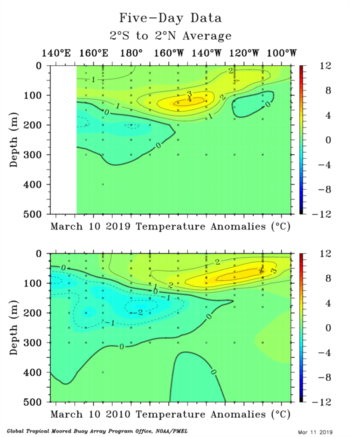 They continue to show a large region of +1C or greater stretching from Nino 3 to Nino 4 (but again I'm not sure if I'm reading the buoys correctly). There's a possibility of a slight dip on Monday to account for the trades returning. Here it is, concentrated over the WPAC, but I think it'll shift over to the dateline as it corrects towards the Euro/CFS. 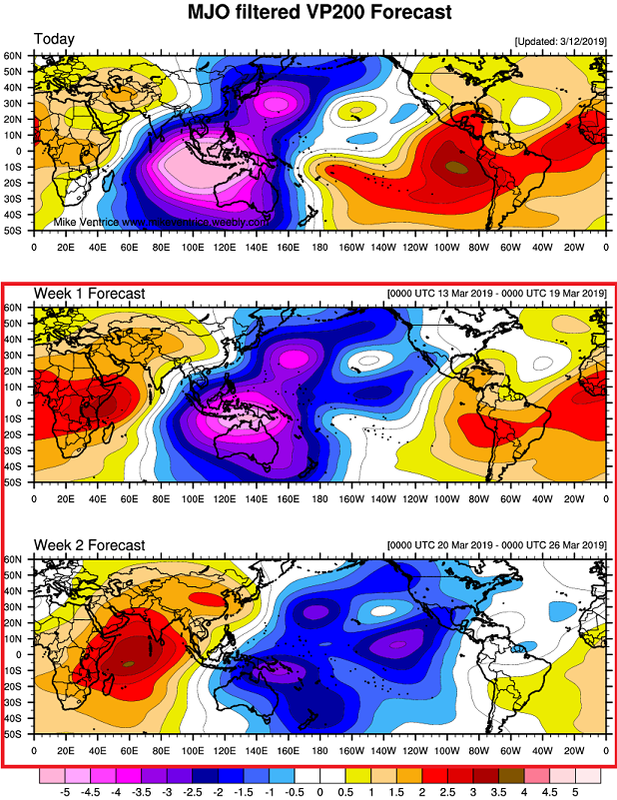 Today the GFS finally adjusted the MJO forecast out of phase 4 and into the circle. but It still doesn't show brief phase 8/phase 1 like the Euro/CFS are. But I think it'll get there. 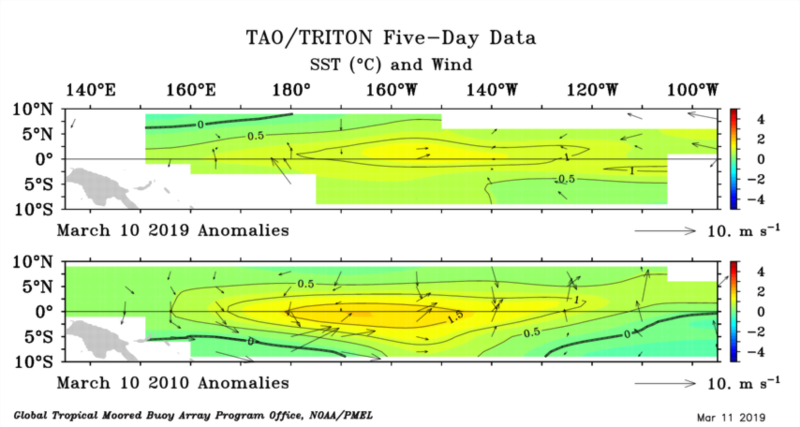 The CPC Weekly update has Niño 3.4 is down to +1.0C. 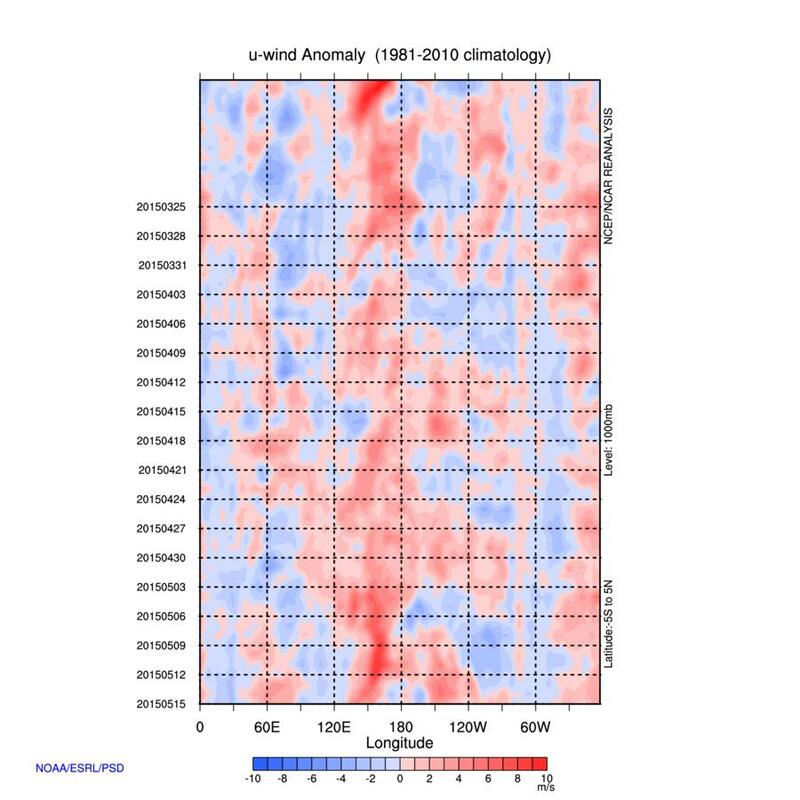 Joe D'Aleo from http://www.Weatherbell.com posted that so far at the subsurface, 2019 is similar to 2015 and 2010. I already talked about the comparisons of 2015 or a possibility of a double El Nino event similar to 2014-2015. But the 2010 comparison is intriguing because it's the strongest La Nina we've seen in the past decade. We can see some similarities here with impressive warm pools been the surface in both years, aided by El Nino's from prior years. Pretty similar so far, but the key difference here is that in 2010 April, the MJO went into phases 4/5/6 which promoted strong trades. 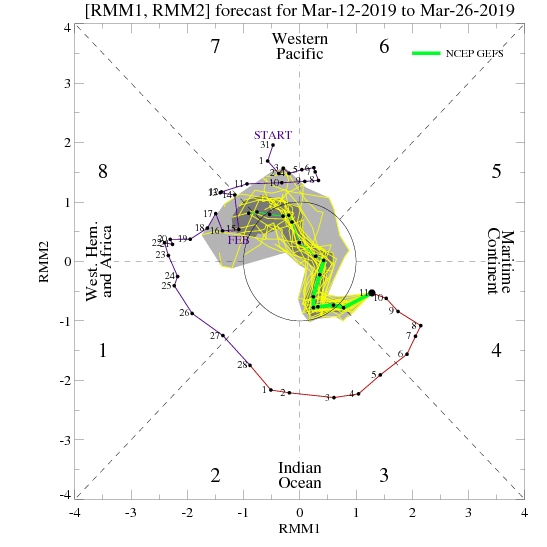 For this year, the MJO is currently in phase 4 but it will be going back into the circle and based on models, possibly re-emerge in the "El Nino phases"
We had a weak El Nino form in 2018 that weakened through the winter and then after a series of successive WWB's in late winter, regained its footing and is intensifying with increased atmospheric coupling. For 2010, it was a classic El Nino to cool-neutral/La Nina transition. There was a moderate El Nino in 2009 that peaked in the winter of 2009/2010 followed by a cold pool forming and propelling a La Nina event that became strong. Models were impressive in calling for this to happen as a lot of models in March showed the El Nino decaying and a La Nina taking over. 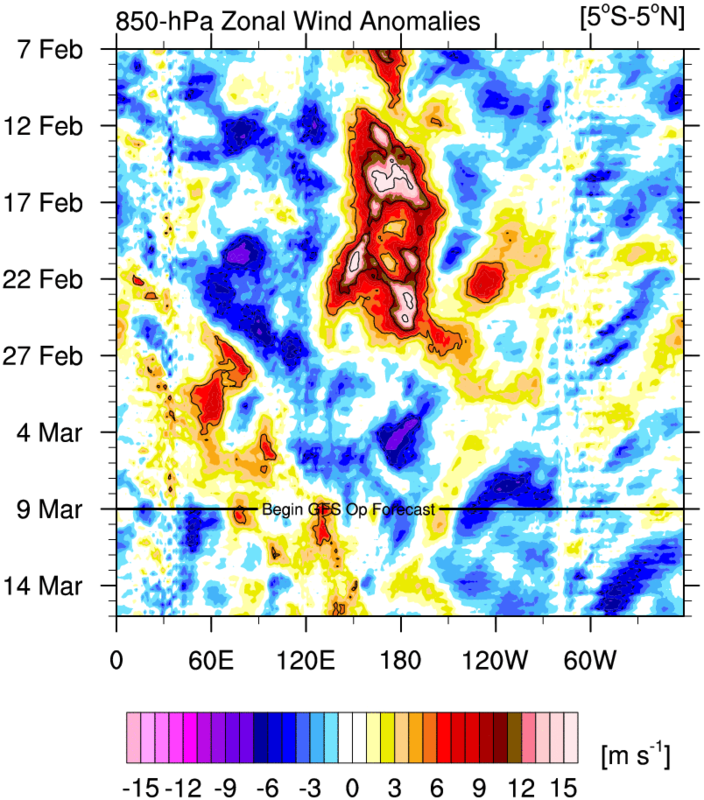 So seeing this, I wouldn't discount something similar to 2010 happening, but I would say it's not likely due to the way MJO is behaving, very coherent and strong downwelling Kelvin wave, and increased atmospheric coupling. 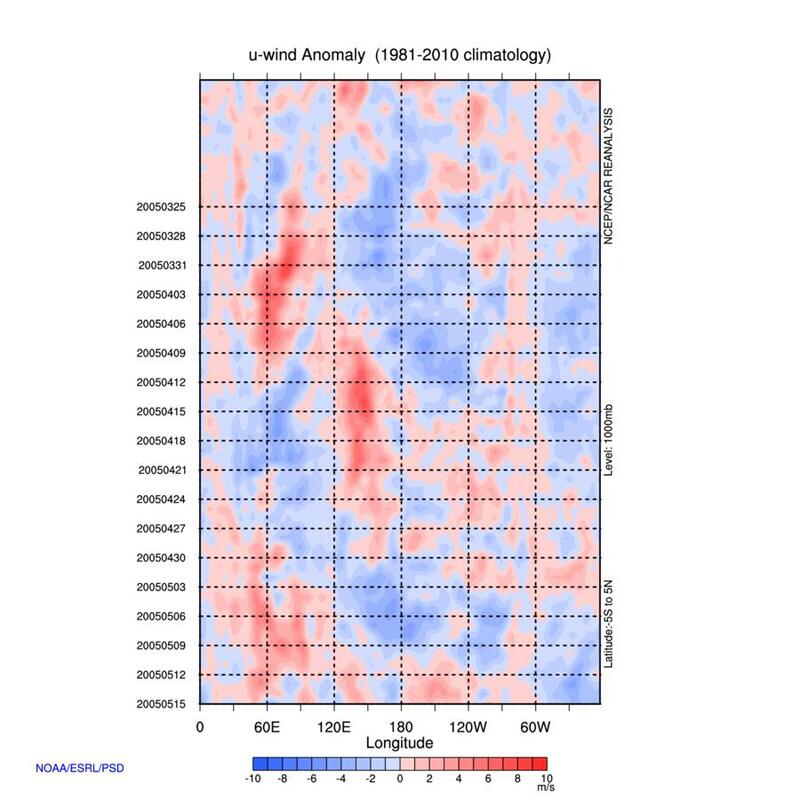 Kingarabian wrote: Joe D'Aleo from http://www.Weatherbell.com posted that so far at the subsurface, 2019 is similar to 2015 and 2010. I already talked about the comparisons of 2015 or a possibility of a double El Nino event similar to 2014-2015. 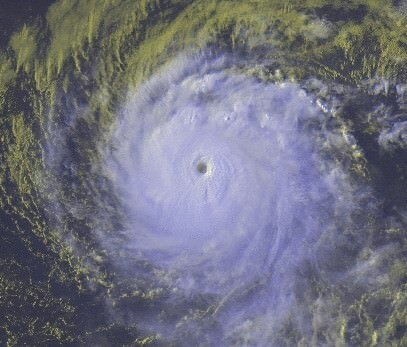 Atmospherically, this doesn't support a formation of a La Nina. Also this Euro should be showing some westerlies in the WPAC at the minimum. 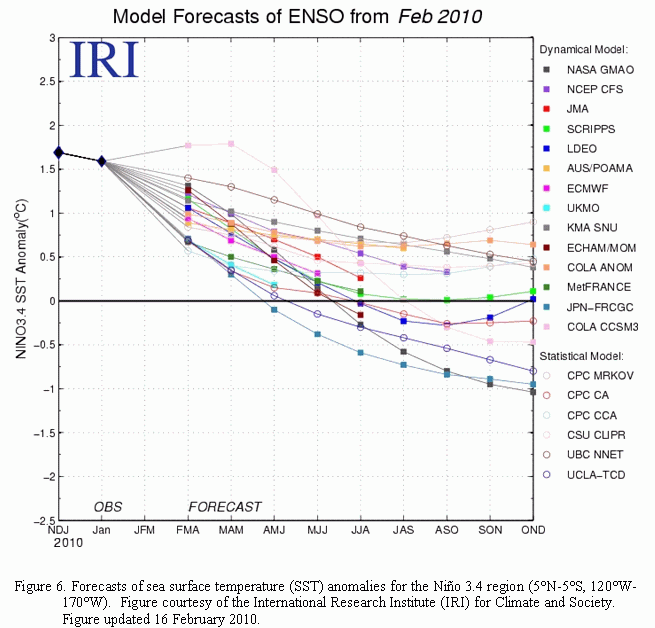 Remember February's 2005 comparison, wrt ENSO (not Atlantic)? Well, it apparently followed w/ 2019, maybe even being stronger. Now, 2005 went into cool neutral/weak La Niña, but 2015 was a super Niño. What happened? So, it looks like a lot of the divergence was in spring. In 2005, mostly normal/enhanced trades existed. This meant the strong warm pool, w/o support, cooled, and wasted away. There was a WWB towards 140°E, but it didn't change the move away from El Niño. 2015, however, was much different. Weak trades dominated. There was a strong WWB ongoing on March 12, 2015, and the tail end of it is seen here. There was also another WWB later. This supported the warm pool, and allowed it to thrive. 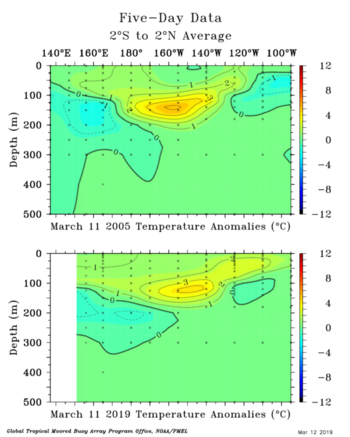 NotSparta wrote: Remember February's 2005 comparison, wrt ENSO (not Atlantic)? Well, it apparently followed w/ 2019, maybe even being stronger. Yup I remember the comparison, as 2005/2015 were my beginning of the year analogs. 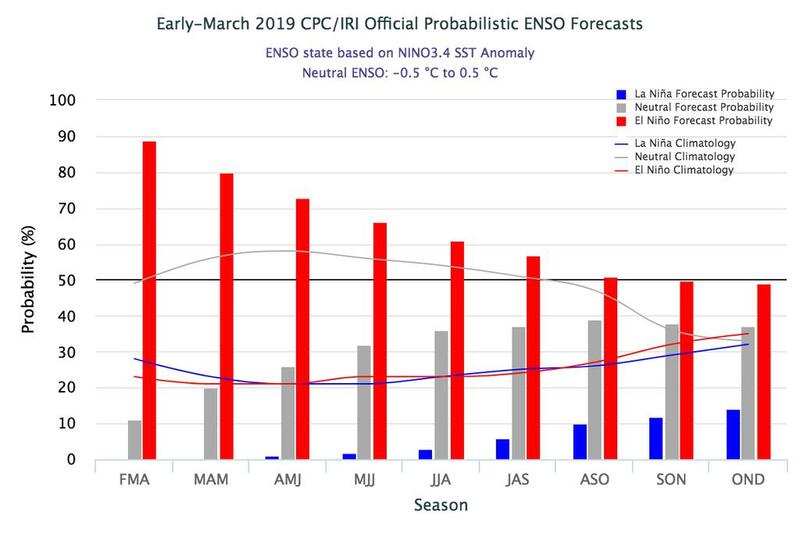 2005 ENSO was going to follow 2019 ENSO through January, lose the comparison through February, and the comparison was to return through mid-March. So it's progressing just as I thought but like 2010, I think that'll be it with the MJO going back into the circle. 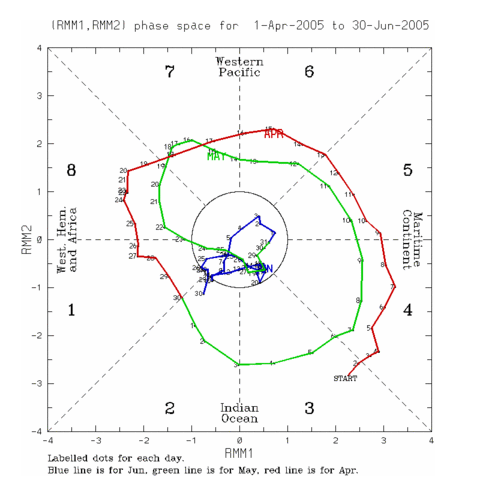 In March and April 2005, the MJO had strong amplification over the IO and the MJO went strong in phases 4/5/6 as well. That promoted strong trades that initiated an El Nino bust, by keeping a lid on the warm pool and reversing ENSO to cool neutral/borderline La Nina by hurricane season. Pretty similar to what happened in 2010. If those week 1 week 2 forecasts verify the SOI drop will continue into April and it's very likely we'll see a WWB materialize over the dateline/CPAC. Yeah, the comparison doesn't work as well when you look at outside conditions. Interestingly, it looked like 2005 had an accelerated Niño, where the warm pool surfaced, was followed by a cool pool & La Niña. Due to the diffs I believe weak-mod Niño is most likely, but as you know much can change due to the SPB. I wouldn't rule much out until it becomes very apparent that window is closing. I'd give it 2-3 weeks tops and then it'll become very clear what's going to happen. April sealed the deal in 2005 and 2010.
cycloneye wrote: Interesting from Ventrice. Biggest difference between 2015 and 2019 in regards to atmospheric forcing is located over Africa and the Indian ocean. In relation to the walker cell, currently we have a much less of a sinking branch in that region compared to 2015. However in the Pacific we have the rising branch and in the Atlantic we see the sinking branch. We'll see what happens in the next 3 weeks.